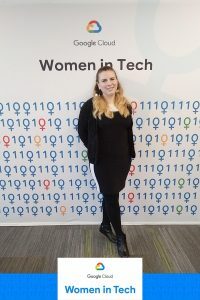 That was the theme of the Women in Tech event hosted by Google Cloud on March 8th, International Women’s Day, at Google’s Fulton Market Headquarters in Chicago. Today, only 20% of positions in tech are filled by women, and only 2% of tech leadership positions are held by women. As we are currently living in a technological revolution discussions about women in tech are timely and important. The keynote speaker Felecia Hatcher, named White House Champion of Change by the Obama Administration, teaches women “how to take up as much space as possible”. According to Felicia, most of women will miss opportunities they want because they’re dressed in overalls & look like work. What we want never looks like what we want it to. 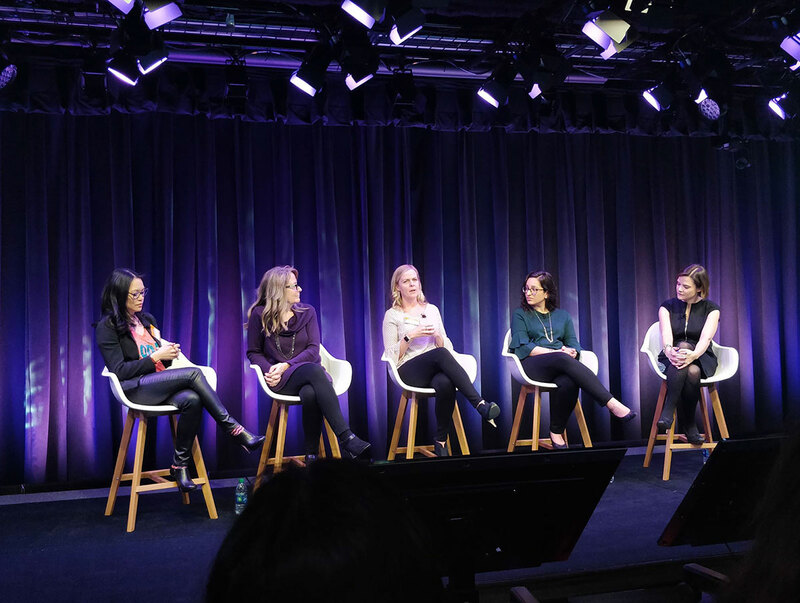 Whether it’s a career choice, a solution to a problem at work, or the next innovative idea, opportunities rarely fall in laps, and it is women’s responsibility to actively seek out and, sometimes, create our opportunities. When choosing a goal and creating a plan it is important to be specific in what you are trying to achieve. If you are not specific in your goals, you leave them up to everyone around you. There was also a great panel lead by Caroline Rile, Field Sales Manager at Google Cloud with Jennifer Brown, K-12 Education Strategist at CDW, Cory Libgot, Lead Product Manager at DocuSign, Deb Coome, Sr. Director of Enterprise Data and Analytics at Ulta, and Andrea Chang, Technology Solutions Delivery at National Restaurant Association. Almost all of them started outside the tech field but pursued positions outside their comfort zone and found themselves in technology. They discussed the importance of surrounding yourself by your own “board of directors” and support group, whether it’s through networking, a professional woman in business group at work, or at meetups, taking a leap of faith and letting your voice be heard by making suggestions and bringing up ideas in the workplace. Deb Coomer’s daughter created and pushed through the maternity leave policy at her workplace, Jennifer Brown showed initiative by submitting suggestions about improving a program just one month into her new position. Although many women suffer from imposter syndrome and find themselves fearful of climbing up, we can help each other by supporting each other, being a friendly ear, offering a word of advice, or just reminding each other of what we already have accomplished. We need to ask for and accept help more often. Fear of failure should not keep us in the sidelines but motivate us to create our next opportunity. After all, people won’t remember the mistakes you make, but they will remember how you handled them. Here at New World Van lines our Innovation Team is 50% women. The Innovation Team has produced amazing software solutions internally that allow us to stay connected to our staff, drivers, clients and transferees with information that helps relocation less stressful. From our drive app that lets drivers on the road see their workload, schedules and gives them the ability to check in and checkout notifying transferees on site that we are here to help to our new operations program that allows our staff to see, plan and schedule all services needed for a move from one connected screen. With a diverse and balanced team, we continue to think of and innovate new solutions by pursuing and creating our own opportunities. And that’s how New World keeps climbing, lifting all our departments with new innovative solutions on its way up. David and Patty Marx traveled to Panama City, Panama to represent New World International at the 50th Anniversary of the Latin America and Caribbean Movers Association (LACMA) from 2/17 to 2/21/19. With more than 225 participants in attendance from around the world, the LACMA conference enables attendees to meet, engage, learn, and collaborate together. The original Panama City was founded in 1519 but was destroyed by fire in 1671. The city was rebuilt in 1673 about 5 miles from the old city center. The people of Panama are friendly, helpful, and full of pride for their beautiful country. Today, Panama City is home to approximately 1.8 million people – nearly half of the country’s population – and has the feeling of a major metropolitan city, joining many generations and cultures together in one place. While in Panama the entire group toured the Panama Canal which was amazing to see. The group was taken to the original lock system, which finished construction in 1914, and a recently opened expansion of the system, finished more than 100 years later, in 2015. 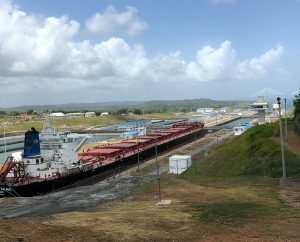 The canal is now capable of supporting cargo ships carrying up to 13,000 shipping containers at a time and can cost upwards of $1,000,000 USD to pass through. Despite the cost, the canal is still a tremendous benefit to shipping companies, as it takes an average of 9 hours to cross the canal system, compared to two weeks of additional sailing time if traveling a route around South America. Time is money. 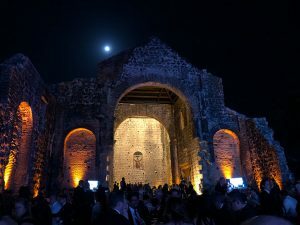 In addition to the canal tour, LACMA held a very nice dinner and celebration among the ruins of the Old City, Panama Viejo. At business meetings the speakers talked about continual change in the moving industry, the impact data and artificial intelligence will have on our business, the power of computers, and how we all must embrace the change and change our companies to remain relevant. It is important that New World attends these global meetings to improve our presence around the world, our ability to work with partners globally to better serve the needs of our clients and to grow our international business. At the end of March, Edwin Ooms, David and Patty Marx will attend the FIDI meeting in Amsterdam, the Netherlands where they will also visit New World’s Rotterdam office. This year marks the fourth year NWVL has participated in Wreaths Across America. Wreaths Across America is an organization that coordinates wreath laying ceremonies at the grave of soldiers in the US, at sea and abroad. 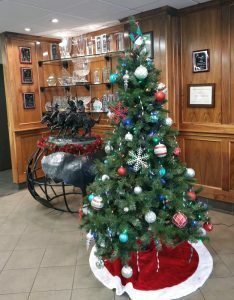 The tradition was started in 1992 by Worcester Wreath when they were left with a surplus of Wreaths during the holiday season. Worcester coordinated with Maine’s Senator Olympia Snowe to place wreaths on some of the older graves in Arlington. In 2005 the wreath laying gained national attention and in 2007 Wreaths Across America was formed. 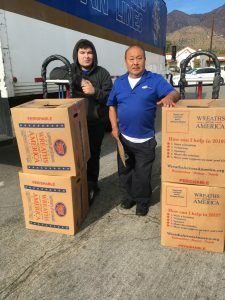 Through the help of wreath-laying volunteers, trucking & shipping companies, fundraising and corporate donations, Wreaths Across America now places wreaths at over 1,400 locations. In 2014 Wreaths Across America was able to cover every grave at Arlington Cemetary. 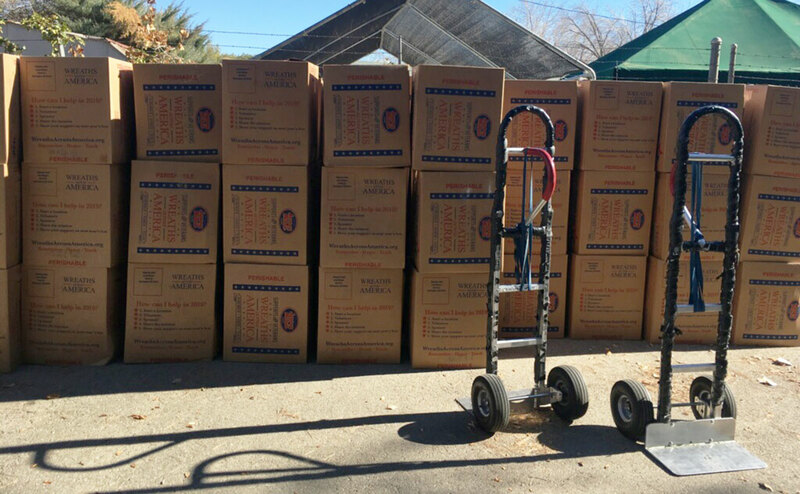 New World is honored to participate and continue delivering Wreaths to remember and honor soldiers across America. To read more about Wreaths Across America and their mission to Remember. Honor. Teach., go to their website at Wreaths Across America. 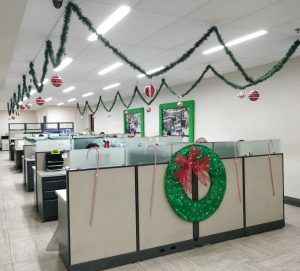 As the Holiday Season is in full swing, New World is adding extra light and cheer in the office with bright and festive decorations. 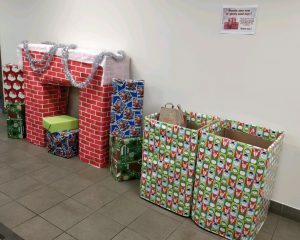 In the spirit of spreading cheer, donations of gently used winter clothing, toys, and canned foods are being gathered for families in need. 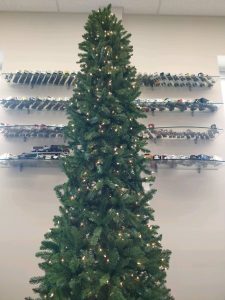 And there’s still much to look forward to with a holiday luncheon and fun holiday outfit contest. We hope to see everyone’s cheery spirits lifted all month long!